THE UNCERTAINTY of Brexit and its impact on workers' rights may have been an immediate concern at this year's TUC Women's conference, but could not overshadow the ongoing issues of sexual harassment, the gender pay gap and societal inequalities. "While I pay tribute to the work of our unions in campaigning against Theresa May's awful Brexit deal, austerity has carried on apace and that disproportionately affects our women workers," said Mark Serwotka, TUC president. "We still live in one of the most gender inequal societies in the world." The gender pay gap and equal pay were the subject of around a quarter of the 43 motions proposed at the 89th TUC Women's conference, held at Congress House in London on 6-8 March. Meanwhile, the NUJ delegation proposed a motion on addressing the gender imbalance among those working in photography. 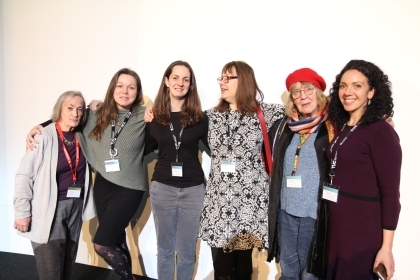 Natasha Hirst, chair of both the NUJ equality council and photographers' council, noted that only 15 per cent of photojournalists are women and called on the TUC Women's Committee to work with the NUJ Women's Network to support the development of opportunities for women in photography. The motion also called for the TUC Women's Committee to promote mentoring, grants and scholarships and proactively address gender imbalance. "The stories being told are framed largely by men," said Ms Hirst. "It is crucial that we have a diversity of voices in photojournalism. We need opportunities for a wide range of women, from different ethnic and cultural backgrounds, with lived experience of disability, poverty and oppression in a variety of forms." Dawn Butler, shadow secretary of state for women and equalities, added her support at the conference, committing to "laying the foundations for an escalator of success", with more women "rising to the top". "The burden of cuts has fallen on women," she said. "But if society is more fair and equal, it is more fair for everyone. It is not about us and them." London Freelance Branch chair Pennie Quinton seconded a motion from the Musicians' Union, which called on the TUC to lobby to extend shared parental pay to self-employed workers. Currently shared parental pay of up to 39 weeks can be split between parents, allowing them to share the paid leave, but the right does not apply to self-employed people. A private members' bill introduced to Parliament by Tracy Brabin MP proposing an extension for the self-employed had its first reading in the House of Commons in February 2018, but a second reading date is yet to be announced. "Self-employed people have children the same as those who are employed," pointed out Ms Quinton. Meanwhile, the NUJ delegation - which also included Ann Galpin, chair of the Disabled Members' Council; Ann Coltart, equality council member; and Magda Ibrahim, co-equality officer for London Freelance Branch - added its support to a further seven motions. These included motions on Universal Credit, mental health, sexual harassment, dignity in the workplace and an inclusive national education service. Pennie Quinton, chair of London Freelance Branch, said: "Our members are reporting serious problems with so-called Universal Credit. Many in the UK who have had variable income have relied on Working Tax Credit in lean months. When government moves them onto Universal Credit they miss out, sometimes massively. "The problem our members are facing is that Universal Credit assumes an income floor reassessed every month so doesn't take consideration of the huge fluctuations in freelancers' incomes." The conference was a chance for more than 260 delegates from 33 unions - as well as representatives from trades councils and the media - to debate issues including part-time and insecure working, period poverty, the menopause at work, global gender equality, non-disclosure agreements, maternity, pregnancy and safety at work.